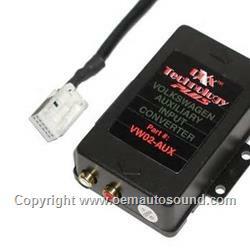 Volkswagen auxiliary audio input interface, This adapters connect to your factory VW radio and allow you to listen to an auxiliary source, such as an iPod iPhone Mp3 or DVD player, through the factory Volkswagen radio No more sound-degrading FM modulator or clumsy cassette adapter. Get clean, CD quality audio playing through your factory VW Radio. The PIE Aux-In mimics a CD-changer and "tricks" your Volkswagen radio into playing the auxiliary source. Not compatible with factory multi-disc CD-changer. If you have the external VW CD-changer, it must be unplugged. 2002-2007 VW with CD-changer control. Listen to an auxiliary source through your existing Volkswagen audio system. No need for sound-degrading Fm modulator. Connects to factory 12-pin connector behind the VW radio. Must be double din radio w Am/Fm Cass CD. Not compatible Volkswagen 2005-up 6-disc radio or navigation stereo. 12-pin connector at head unit double din radio only stereo size 4 inches tall. use pie part # Vw-aux if vehicle is pre-wired with 12-pin connector.